Make no mistake, the game is changing. Leaders from both the private and public sectors are taking a more active role in urban development and the regeneration of our cities. Not only are our cities evolving more rapidly, more people are taking an active interest in how our cities are evolving. Which is great news (and a challenge) for property marketers. Buildings may be the most local of all products, but they are influenced by a whole world of architecture and design. Each new development is an opportunity to build (pun entirely intended) on the ideas and experiences of other planners and architects and adapt them to different parts of the world. Success in one city quickly stimulates demand in another (almost every other city is looking to re-create a version of New York’s Highline Park), and the same often occurs with buildings. This is a sign of progress, not imitation. Tell the story of how you’re building upon the best ideas in the world and improving them for your market. Buildings might be constructed of steel and glass, concrete and timber, but cities are built on ideas. And ideas are created by people. When you go behind the materials and specifications (the what of a building), you find the inspiration and the thinking (the why of a building). Go one step further and explore the who of your particular development. Tell the story of the people behind (and inside) the building: the architect’s vision, the developer’s sense of responsibility, the tenant’s dreams for the future. 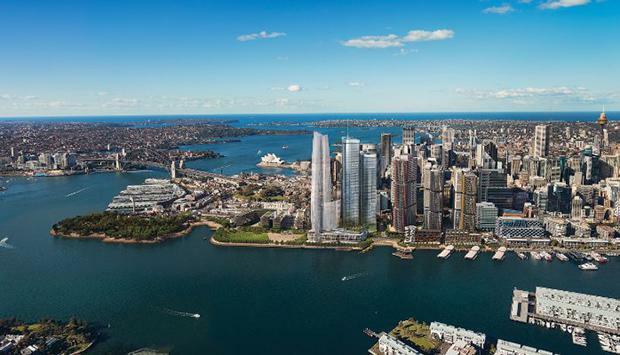 When Barangaroo profiled their marquee retail tenants for International Towers Sydney, the audience learned abut the restaurateurs’ passion for food, for Sydney and its harbour. Their enthusiasm for the project is almost infectious. Want to write the Next Chapter? Gather together a few of the leading personalities responsible for your development for a panel discussion, a written interview or even a guided video tour of the site or precinct. Influence and reputation has always mattered in the world of property and architecture - now we have maps of these influence networks. We’ve come to embrace social platforms in B2B marketing world but it’s still important to avoid viewing social as ‘free media space’ to distribute your marketing materials. Listen first, then be helpful, be useful or be entertaining. And when you do post, adapt your content to suit the specifications of each channel. Tell your stories in shareable sizes and formats, woven from useful information, interesting insights or informed commentary. Think lead generation rather than direct sales. Brookfield invited a group of interior designers to create their own vision of ‘the workplace of the future’ in several different buildings in Los Angeles, then set about creating shareable videos, interviews, photo galleries and quotes. Design a part of your site or service or aspect of your organisation to be the subject of a ‘social media documentary’ and cover the journey the way a reporter might. Use social to invite your audience to take a look inside your project or team. With urban leaders increasingly thinking about their cities as an integrated landscape, rather than series of discrete buildings and streets, it’s time to think of your development as a new voice joining an existing conversation. How would you introduce yourself? What would you say or do to show you’ll be a good fit for the precinct? Consider how your neighbours might talk about you and write your story from that perspective. They might even start to re-tell it on your behalf. Tell the story of what your development will bring to the wider neighbourhood and its residents - both potential and existing. Power House is a regular publication that takes the ‘lifestyle magazine’ format and applies it to the whole area around the Battersea Power Station urban regeneration project. Each edition adds characters and chapters to the story of how a forgotten piece of London is being re-born as thriving new urban precinct. Make the ‘community consultation’ phase of your development an ongoing stream of dialogue and communication. Whether printed, digital or a physical place, it becomes a research lab for you to learn about the market – and for the market to learn about you. Behavioural psychologists have proven what we’ve long suspected: all decisions are emotional, it’s the justification which is rational. Which means the people who make big emotional decisions about property – whether it’s a CEO moving their global headquarters or a couple choosing their luxury apartment – have to tell rational stories to their stakeholders and influencers, too. You can help them by creating clear, succinct rationalisations, backed by compelling facts, tailored to the language of their audiences. In effect, you become the ghost-writer and your customer becomes your media space. Tell versions of your story that speak directly to different stakeholders and their interests: finance, talent, culture, safety, environment, innovation, community and so on. Most stories hew to a well-known set of archetypes and formats: property is no different: glittering facades, architectural renderings, CGI fly-throughs and lots of semi-technical (but not too cluttered) floorplates. They're all useful to help visualise a property, but are rarely different enough to be remembered. Look to other industries and other types of marketing for ways to stand out, but beware of gimmicks and tricks that have little relevance to your core proposition. Tell a story that uses a memorable hook, such as a spokesperson, a popup, a gift, an unexpected colour, unusual object or striking image. Ask a local historian, a film maker or a street artist to collaborate with you on the stories, films or visuals you create for your project. It will have a relevance and authenticity that makes for compelling viewing. As an added bonus, it will look like nothing else in your market. In any category, there are certain things your audience simply expects you to get right. In property, these might be beautiful renders, transport maps, floor plates, and stock photography of residents and tenants - all wrapped up in a glossy brochure or iPad app. These are important, but they are now the cost of entry. Table stakes, if you will. As cities and buildings become more complex and more interesting, the challenge is to inspire more complex, interesting conversations about your projects. The opportunity is for you to become a developer: of complex, interesting stories for the built environment. Barrie Seppings is the Director of Creative Strategy at Wordsearch Australia, the world’s leading marketing agency network for architecture and real estate. His job is to develop stories for the built environment. Follow Barrie on Twitter. About The Wordsearch Expert Series: our global team unpacks trends and insights from the world of real estate, property development, architecture and urbanism, once a month, every month.